Irish karate athletes (file photo). IRELAND’S OLYMPIC KARATE hopefuls will be allowed to compete at the upcoming European Championships after the World Karate Federation (WKF) intervened in the political dispute which continues to divide the sport in this country. With Tokyo 2020 on the horizon, athletes have been caught in the middle of the row which has seen Irish karate split into two different organisations – Karate Ireland ONAKAI, and ONAKAI — with both claiming to be the valid National Governing Body (NGB) of the sport. 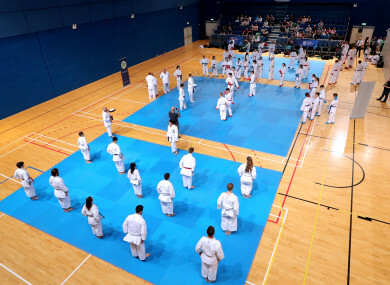 Athletes affiliated with Karate Ireland ONAKAI were previously warned that they would not be allowed to compete internationally in WKF events unless they switched allegiance to ONAKAI. Ahead of the 2019 EKF European Championships, which begin in Guadalajara, Spain next week, the WKF has intervened to protect the athletes’ right to participate. “The World Karate Federation would like to point out that these athletes have already previously participated in many WKF events including World Championships and Karate 1 events, also very recently,” it reads. “As for the current issue concerning the registration of athletes in the upcoming European Championships, the WKF is aware of the internal governance dispute in Ireland and has, in fact, worked together with Irish bodies to secure the welfare of the athletes. “Since a solution to the conflict seemed not likely to be found in a near future by the parties in their internal dispute, the WKF decided to take action and Irish athletes will be allowed to participate at the upcoming EKF Senior Championships with the direct coordination of all parties by the WKF. Email “World Karate Federation intervenes in Irish political dispute ahead of European Championships”. Feedback on “World Karate Federation intervenes in Irish political dispute ahead of European Championships”.